BAKING SODA, white vinegar, lemon juice, borax and essential oils should be in your “clean green” arsenal. Store shelves are loaded with household cleaners claiming to be safe for the environment. 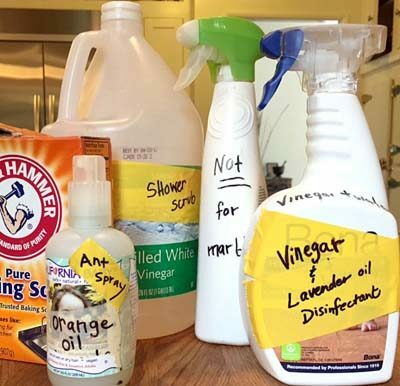 But we know that claims can be false and boasting of “natural” ingredients doesn’t necessarily mean a product is without concerns.If you really want to rage a war on filth while being as green as possible, soldier up and make your own cleaning supplies. Stockpile shells, or in civilian terms: empty containers. Use old spray pumps and plastic jars that have been emptied of their previous ammo. Use masking tape and a magic marker to label your own line of soap scrubs, disinfectants and scum bombs. De-greasers. If your store-bought degreaser says it can explode, it’s toxic! Using oil-based degreasers can result in serious pollution. They leave behind chemicals on surfaces and spills can seep into groundwater. They contribution to ground level ozone when they evaporate. Use less Simple Green and more Rosie the Riveter. Roll-up your sleeves and apply elbow grease. Mix equal amounts of water and vinegar to form a basic disinfectant and degreaser. Spray or rub directly on grimy areas. Use this mixture on almost anything except marble and granite. If the vinegar solution doesn’t pulverize the grease, try olive oil. Often the oils will combine to loosen gunk so that they can be wiped away without resorting to the harsh chemicals. Dishwashers. Phosphates were banned in automatic dishwashing detergent in 2010 because the chemical compounds polluted waterways, spawned algae and starved fish of oxygen. Sadly, dishwashers aren’t as effective without the phosphates. Boost your washer’s effectiveness by periodically adding two cups of vinegar to the empty dishwasher and run on the coolest cycle. This removes the hard water build-up in machines. Adding vinegar to the rinse aid dispenser can also help with spots. Shower glass residue. Save time cleaning the shower by rubbing a small a dab of baby oil on the shower glass while it’s dry. The oil acts as a frontline barrier against moisture so that mineral residue isn’t left behind when the water evaporates. Keep a squeegee on hand in the shower to get rid of water spots between cleanings. Sinks and toilets. Create your own scrubber with the following formula: ½ cup baking soda + 1 cup vinegar + ½ teaspoon tea tree oil. When stains get really tough, substitute ¾ cup borax for the baking soda. Wood. Furniture polish is listed on the Hall of Shame at the Environmental Work Group (EWG), an online guide dedicated to researching consumer products. Some of the most popular polishes can be toxic if inhaled. For a safe shine, add a squeeze of lemon juice to either olive, jojoba, coconut or walnut oil to make a natural wood polish. If a nick needs to be filled, infiltrate a crayon box. Find the right hue to match your wood and kaboom! Nicks be gone. Gum and goo. Adhesive removers contain products that can lead to respiratory problems, skin allergies, developmental and reproductive toxicity, cancer and environmental damage. Yikes! Try torching gooey gunk with a hair dryer instead. Heat will soften most adhesives, so give that gummy stuff a blow out. Once it loosens be ready to pounce with a rag before the stuff hardens again. Remember that mission accomplished doesn’t always mean the war is over. The ubiquitous L.A. dirt will return just as the Southern California sun always shines.